Charlie Grant’s older sister is getting married this weekend at their family home, and Charlie can’t wait—for the first time in years, all four of her older siblings will be under one roof. Charlie is desperate for one last perfect weekend before the house is sold and everything changes. The house will be filled with jokes and games and laughs again. Making decisions about things like what college to attend and reuniting with longstanding crush Jesse Foster—all that can wait. She wants to focus on making the weekend perfect. How do I even begin to review a book that I loved reading so much? One that has surely made its way into my top five favorite books of all time? How do I put into words how utterly fantastic a book is? 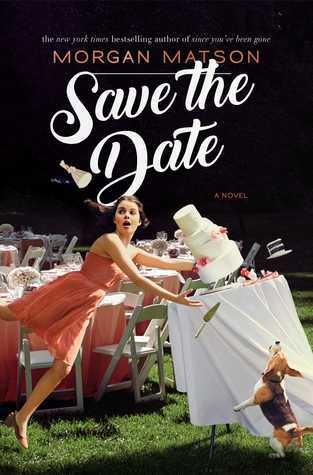 That is the problem I’m having as I sit here trying to type up this review explaining exactly why Save the Date should be moved to the top of your summer to-be-read list. Save the Date takes place over three days—the weekend of Charlie’s sister’s wedding. Charlie is the youngest of five and the only one left in the house. Her three oldest siblings are in their mid-to-late twenties, and the brother closest to her in age is in his second year of college (and hasn’t been home in over a year). Their tight-knit family is the stuff legends are made of, a legend that the world knows about thanks to their mom’s comic strip panel that followed their family as the siblings grew up. However, their whole family has not been together in a long time, and Charlie absolutely cannot wait until all of her siblings are back in their childhood home for one last hurrah before Linnie gets married and their parents sell the house. Things do not go exactly as Charie had planned, though, and disaster upon disaster keeps hitting the wedding—such as a stolen suit, a destroyed cake, and a power outage. I absolutely adored the family dynamic. This is a big cast, and I loved the way how each of the family members played off of each other and had their own personalities. It was so much fun seeing the different relationships between the siblings and how they played with and teased one another. I would jump at the chance to read hundreds of more stories about this fictional family. Although the wedding disasters were hilarious, the main focus of the book is on Charlie as she realizes that everything isn’t quite as perfect as she thought it to be. Honestly, I related to her so much as she deals with this “end of an era” and how she doesn’t necessarily want to move forward yet. She doesn’t want change, but throughout the story, she learns that she needs it. She starts to see that maybe, just maybe, she’s been living too much in the past and within the memories of her family’s fictional comic strip. She starts to see that the brother she idolized isn’t faultless, that she doesn’t actually know anything about her longtime crush, and that her family isn’t as solid as might have believed. Based on the blurb and previous Morgan Matson books I read, I was expecting there to be more romance in the story. However, the romance was a very small point in the novel, and I was glad for it. Even though I love romance, I loved that the focus was almost solely on Charlie and her family. Bill, the wedding coordinator’s nephew, is pretty cute though, and I was happy with his part in the epilogue at the end. Overall, Morgan Matson has done it again and written another hit. Save the Date is one of my new favorite books, and a summer must-read! Readers will fall in love with the Grant family (and with the comics featured in the book)! Morgan Matson was born in New York City and grew up there and in Greenwich, Connecticut. She attended Occidental College in Los Angeles, but halfway through a theater degree, she started working in the children’s department of Vroman’s Bookstore and fell in love with YA literature. Her novels have been translated into dozens of languages, and published all over the world. She currently lives in Los Angeles with her dog, Murphy. This book sounds so perfect!!! I can’t wait to read it!! Amazing review! This sounds fantastic! I love that this is more of a family dynamic book instead of a romance. Thanks, Jenn! I hope you check it out! So glad you loved this one!!! I am very much like Charlie in that I hate change and get really sad when I feel the “end of an era” coming up. I am definitely trying to get to this book soon– it does sound like the perfect summer book. Thanks for being on the tour Jordan!! We were happy to have you!! !